I tried to concentrate on the position, where to put my legs, how to wave my hands, and all the time I was thinking: am I doing this right? What if I do something wrong? Yes, in the beginning it feels kind of awkward to practice at home. Because, how often do you stand in your room, alone, no music and just your body, mind, and you? Yes, that can be intimidating. But the thing is: that’s ok. Basically everyone starts like that (well except maybe those Chinese masters who started at the age of 5 under the supervision of their father). 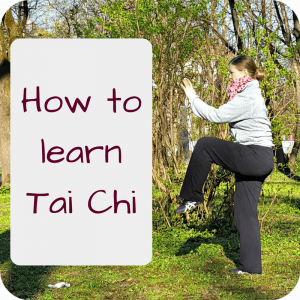 Everyone starts with Tai Chi for beginners. Everyone on the Tai Chi route needed to overcome that awkward silence and being-alone-with-myself-ness. I guarantee you: it’s worth it. And practicing at home is actually quite easy. Because all you need is a bit space and the memory from your last Tai Chi class. Just stand in the middle of a free area in your apartment. For example your living room, kitchen, bedroom, hallway. Just any place where you can open your arms freely and make a step in each direction. Now remember one move from class. You don`t need to be able to go through the whole form! Just one Tai Chi move. And if you don’t remember any move, just stand still. Get in the opening position in a hip-width-stand, arms hanging on the side, and just stand upright for 2-3 minutes. That’s it! That’s a really great start! Hooray! If you cannot remember a move at all, I recommend that for the next Tai Chi class you take paper and a pen with you. Maybe you don’t want to write during the lesson (depending on your teacher). But right afterwards, sit down and scripple down some notes or drawings of one move you want to try at home. And then, at home, just stand, get ready and then try what you’ve written down. Play with it. See if the notes still make sense at home. Write down any questions you have – and then ask your teacher the next time you see him/her! Really, when I was a teacher, the best thing for me was to see that people practiced at home. Because you can go to classes, but you will really benefit the most (and get the most value for your money!) once you practice at home, too. Practicing at home is the biggest compliment you can give your teacher! And it’s the best thing you can do for your own health. Ok, so you did your first short sessions at home. Now just continue like that. 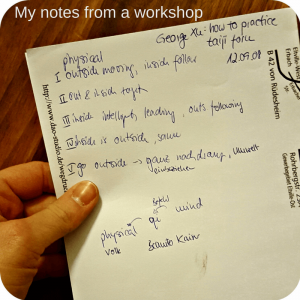 Write down some notes after each class and go through them at home. See what you remember other than the notes. Play with it. Digest it. Make it your own experience. Incorporate it – make it a part of you! And after more than 12 years with Taijiquan and Qi Gong I can tell you: I still do that! It doesn’t really change that much if you do Tai Chi for beginners or if you are a more advanced student. Maybe it becomes easier for you to remember insights or corrections or details. But it’s still all about incorporating those details at home! And increasing the session time. As you start with a couple of minutes, just work yourself up to 5 – 10 -30 minutes or more each day! Make it a habit. Try to practice every day. It’s easier if you practice always at the same time and the same place. Make it a ritual. 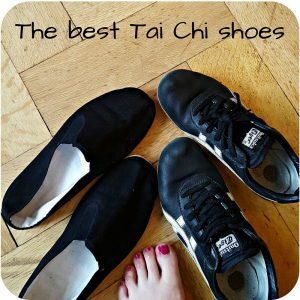 Get your Tai Chi shoes on. Salute just like you would in class. 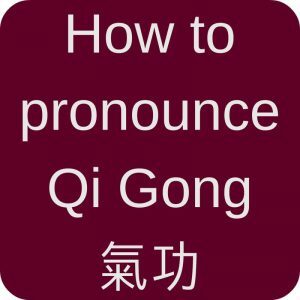 Do the closing like you would in class and store that valuable Qi in your Dantian! Read. 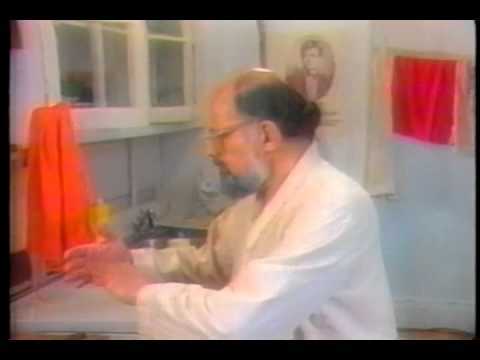 You could read about Taijiquan in general or maybe find a book with details about your style & form. You’ll find many ideas, concepts, principles to think about and practice. For a start, have a look at my list of best Tai Chi books. In conclusion, just get up and start practicing! You know how to do Tai Chi at home now! JUST DO IT! 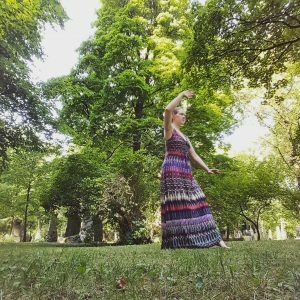 If you really don’t know which Tai Chi exercises to do, you could also have a look at my compilations of videos and do 5 minutes or 10 minutes of Qi Gong exercises! I also practice my Tai Chi forms in a wide variety of places. Essentially two kinds of places — one is the “retreat” type of place, a location in my house or yard that I arrange specifically for doing the forms; but the other is anywhere, anytime, in whatever clothes I have on at the moment. For the first 20 years or so, I always fretted when the space wasn’t quite big enough, but a few years ago my master challenged me to work out the form (in this case the standard 42 form) so it is done within a 1 meter square area. Well, I haven’t succeeded with the whole 42 form, but I did adapt a shorter set of 14 moves from that form (mostly) and have been doing it every morning for nearly 3 years now, after a bit of qigong warm up. The basic challenge to doing a form in a 1 meter square is working out the steps and weight transfers — have to make quite a few extra transition steps in order to be able to do it that way and still perform each move as it is supposed to be done. And making those extra transition moves fit into the flow of the form as smoothly as possible. Do you use music when you practice? that’s really a great idea to adapt the form to a smaller space! I will try that, too. In the long form there are many repetitive steps which make it more space-consuming. I very rarely use music. However, I recently got some wonderful Tibetan bowl music and I like to play that sometimes. Any form can be done in a square meter. Any time the feet cross each other in the form you do a change step. It’s really nice to know. Once you learn the basic principle of doing a change step it’s not complicated, but it is more physically difficult. Get a teacher that understands change step to show you. thank you for your comment. Do you maybe have a video to explain the change step? When there is a marching band, and one person finds himself out of step with the entire rest of the band, he does a change step. It’s the same when you come to a wall or choose to stay in a one meter area while doing tai chi. You do a step but do not move forward. I do not consider myself a person that should be instructing anyone, so I can’t upload a video demonstrating. But I will look for a link to one and if I find it will post here. But I can tell you a fact – any form can be done in one square meter, by doing change step any time the feet cross each other during the form – when you would be moving to a different spot. It’s actually very simple pls ask your teacher. What’s cool too is you then have a new version of any form you know too …. normal and change step versions.